A law firm that helps you achieve your dreams. Pollywog was approached by a group of attorneys who wanted to rebrand their firm, which they had named after the Greek goddess, Themis. Determined to engage clients with a high degree of humanity and earn the role of advocate and counselor, the attorneys had structured their fees to take the emphasis off of hourly billings and place it instead on project-based remuneration. Many of their clients were entrepreneurs needing intellectual property services—inventors, artists and other creative types. Central to the firm’s mission: to use the practice of law to help clients achieve their dreams. 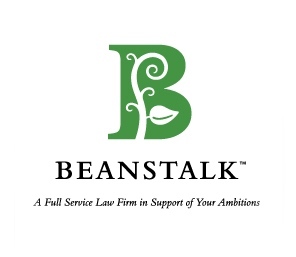 Pollywog created the brand, Beanstalk, to appeal to the firm’s visionary clientele and communicate the benefits of having an attorney who supports their aspirations. You have big plans for your business, and we can help make your dreams a reality. While your head’s in the clouds, we’ll help you keep your feet securely on legal ground, making sure your intellectual properties—your patents and trademarks—are well protected. “Beanstalk” is virtually synonymous with the “Jack and the Giant” fairy tale. This connection conjures up themes of risk-taking, treasure-seeking, and triumph over much bigger foes—all resonant ideas for the aspiring entrepreneur.